Aesthetically, the difference between the old and new behaviors is subtle, and probably is subject to personal preference. What makes a big difference is when editing multiple cells by first making a selection via shift-arrow, then editing them one by one within that selection by using the ENTER or TAB key to navigate through them. Or when copying & pasting a range of cells via keyboard, by first making a selection to copy, then moving the cursor to a destination cell to paste. Power users tend to do this, and they are being put off by how Calc places the cursor always at the “end” of the selection. In their mind, the current cursor placement is “wrong”. Competitively speaking, the new behavior is what most other spreadsheet applications behave (Excel, Gnumeric and GoogleDoc, in particular). So, there is also a benefit in keeping it consistent with the rest of the spreadsheet applications, to make it easier to migrate power users to Calc. I just checked in to the Go-OO master branch an enhancement to Calc’s HTML table import feature. With this enhancement, you can select a custom language to use when you import an HTML table, which affects how the numbers are interpreted during the import. Each language adheres to a different set of conventions, such as date formats, thousands and decimal separators, and other special number formats. Previously, Calc simply used the system’s language setting when importing an HTML in order to decide whether a cell is a nubmer or a text, and if it’s a number, what numbering format to apply. 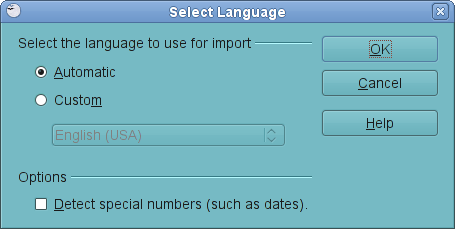 Although you could change the system language in the global options dialog, that was not always convenient especially when all you need to do is quickly import an HTML table with different language conventions, and you don’t want to bother changing the global language setting (and changing it back after the import is done). That’s where this enhancement will come in. What can you expect with this change? when you are importing an HTML table, to either select the system’s language (Automatic), or a custom language from the list of available languages. Just remember that, if you don’t know or don’t care about what language to choose, select Automatic and move on. If you do care, then select Custom and pick a language from the list. There is an additional option below, to toggle automatic number format detection. 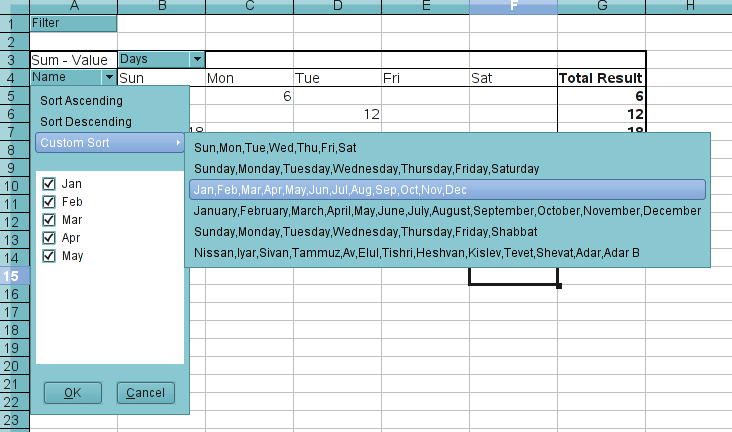 With this option checked, Calc will try to automatically detect special number formats, such as dates, scientific notations etc. If unchecked, Calc will only detect the simplest numbers i.e. numbers that only consist of digits, decimal separators and thousands separators (and a sign if there is one), while all the other numbers are imported as text. By default, this option is NOT checked, which means Calc will only detect the simple numbers. BTW, I’m thinking of adding a similar option to the csv import, where automatic date conversion has been quite problematic in the past and driving lots of users crazy. Adding this option also to the csv import would IMO make sense. In the upper half of the window I’ve added a menu-like control, with the custom sort lists being provided in the submenu. The UI is fully functional, but still a bit rough around the edges. The custom sort list submenu, in particular, may need some additional work to handle a large set of custom sort lists, a sort list that is very long, or stuff like that. But as long as your sort list is in modest size, it should work just fine. This feature didn’t make it in to 3.1 since we are in a stabilization phase for 3.1. But as soon as we branch master for the stable 3.1 branch, I will enable this feature in the default build in the master branch.